The blind wolf, known as the morolaath by the Forerunners, is a predatory animal. Stuffed toys based on the creature are sold to human children. 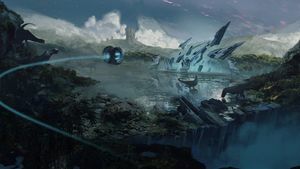 A joint UNSC–Swords of Sanghelios task force encountered blind wolves during an expedition to Installation 00 in 2555. Blind wolves are a bipedal reptilian species with a long tail. Their nostrils are located between the top of their head and jaws. Blind wolves have no arms or eyes, hence their name. Using its powerful, three-toed legs, a blind wolf is capable of reaching high speeds while running. They are also capable of jumping some distance off the ground. Noted to have carnivorous theropod-like anatomy, a blind wolf has large fangs that extends from their bottom jaw and smaller, but sharp teeth from the top jaw. The blind wolves' powerful jaws allowed them to rip apart a human in seconds and even kill a chaefka. Due to their lack of eyes, blind wolves are forced to rely on their other senses. Their sense of sound is seemingly quite acute, as one blind wolf was able to detect a human sighing ten meters away and pinpoint his location, despite an ongoing fight between the blind wolves and the chaefka. However, a blind wolf's sense of smell appeared to be rather poor, as they are unable to smell a human a mere couple centimeters away. Blind wolves appear to travel in packs of at least six. The alpha of a pack takes lead of the other members, which fall behind it to make sure they can follow in the same direction as their alpha. Without any sounds audible to a human or Sangheili, blind wolves are able to communicate with fellow pack members. While hunting for food, the animals keep their heads low and move slowly, relying on their senses of sound and smell to detect possible food. Although persistent, fear could negate their pack mentality. When a blind wolf grows irritable, they will snap their teeth in the air at random. Blind wolves gave out noises that sounded familiar to wolves of Earth, including a loud howling. On the Halo 2 multiplayer map "Terminal", the male announcer says occasionally says, "A child’s 'My Pet Blind Wolf' stuffed toy has been found. Will the owner please claim it at the lost and found?" In Halo Mash-Up: Minecraft Evolved, some horse mobs are textured to resemble the blind wolf. In Halo Wars 2 multiplayer, the Green Machine, a personalized variant of the Mark I Prototype ADS used by Leader Avery Johnson, is equipped with sonic blind wolf repellers. The blind wolf was planned to be featured in Halo: Combat Evolved as a player-controlled mount. It was removed from the game due to problems with the control scheme and the artificial intelligence. It was said to have a symbiotic relationship with a local insect species, which would lead the blind wolf to prey and so get to scavenge off the carcass. Sketch by Marcus Lehto with its insect companion. A 3D model of the blind wolf. A pack of blind wolves run past a Warthog. Several blind wolves on the partially destroyed Installation 00 on the cover of Halo: Hunters in the Dark.